Can I bring a guide dog, eye or hearing dog into the San Francisco Dungeon? 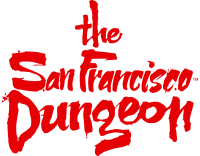 What disabled access is there within the San Francisco Dungeon? What if I am a Hearing Impaired Guest? I am visually impaired will that impact on my experience? Do you have accessible toilets/restrooms? The Dungeon is very dark and those with low vision or visual impairment may have difficulty navigating around the facility.